WHILE A BILLIONARRE ENJOYS THIS POOR AFRICAN COUNTYR'S WEALTH WITH HIS FAMILY WITH HOSPITALS WITHOUT DRUGS, ONLY A UNREASONBLE MIND CAN SUPPORT THIS NAKEDNESS! AFRICA AND AFRICANS WE BETTER GROW UP, THIS IS SHAMEFUL-NOT ONLY ABOUT THE PICTURES, BUT MORE ABOUT THE MILLIONS DYING IN POVERTY IN SWAZILAND AS THE KING KEEPS MARRYING. HOW MANY SWAZI MEN CAN AFFORD TO CATER FOR ONE WOMAN, LET ALONE TWO? Africa my beginning ,Africa my ending, Oh, what a beautiful country with its beautiful cultures. 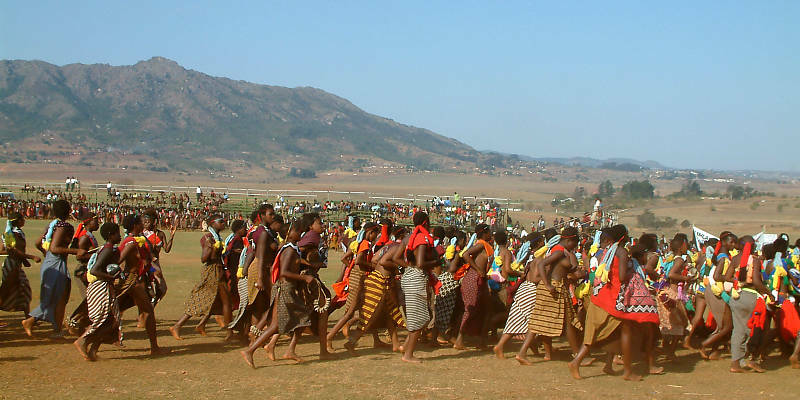 Land of culture, land of African beauty. God bless Africa!. Africa the Land of beauty and culture. Where else in world can you see such rich culture? But at the same time , polygamy should be eradicated because the women and children that suffer in the long term.